The GT-001 packs the acclaimed amps and effects of the GT-100 Version 2.0 in a stylish desktop processor for your home studio or mobile rig. Its small size fits easily into any workspace, while the intuitive interface makes it simple to dial up world-class tones for recording and practice. In addition to the guitar input, an XLR mic input is included for capturing vocals or acoustic instruments, and the built-in USB audio/MIDI interface provides a direct connection for creating music with your favorite DAW. Like the GT-100, the GT-001 offers powerful sound creation possibilities with dual amps and effects chains and flexible routing options. On top of that, a newly developed guitar-to-MIDI function lets you have fun with Guitar Friend Jam and other computer programs from a normal guitar input—no special pickup required! 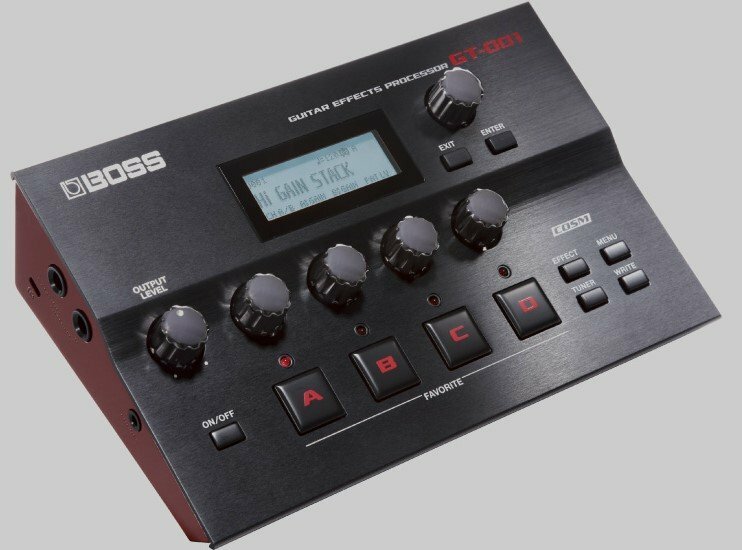 Available as a free download, the BOSS TONE STUDIO software provides a cool graphical interface for tweaking tones from your computer, plus access to BOSS TONE CENTRAL for free studio-ready patches and much more.